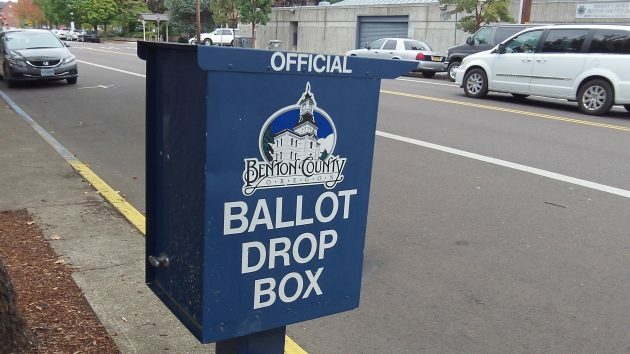 One proposal on the Nov. 8 ballot in Benton County would slightly change the way we vote, and if we adopt it, we might set an example for Oregon that could improve the way our government works. Benton ballot measure No. 2-100 is an initiative that would amend the county charter to adopt “ranked choice voting” in future general elections for the county’s elected officials, the three commissioners and the sheriff. It would work like this. If there are more than two candidates, voters could name their first choice and as many choices as there are candidates. The candidate getting a majority of first choices wins, just as now. If no one gets a majority, second choices of the last-place candidate are added to the others. This continues until one candidate gets a majority and wins. The system is not new. Australia, Ireland and the city of London use it for some or all of their elections. So do the Twin Cities in Minneapolis and eight other major cities in the U.S. It’s also used in student elections at many colleges and in the Oscar voting for best picture. Howard Dean, the former governor of Vermont, advocated it for national elections in an article in the New York Times the other day. And in Maine, voters will decide this election whether to use it starting in 2018 when choosing their governor, state legislators and members of Congress. As the letters in response to Dean’s op-ed in the Times show, the system has both backers and detractors with distinguished credentials. But in Oregon, it might have done us a lot of good if it had been in use for the past generation or so. In 1990, Democrat Barbara Roberts was elected governor with 46 percent of the vote because conservatives split their support between Republican Dave Frohnmayer, who had 40 percent, and socially conservative Libertarian Al Mobley with 13 percent. Assuming that most of the Mobley voters’ second choices would not have gone to the activist Democratic, we would have ended up with Frohnmayer as governor for four and probably eight years. That would have prevented the beginning of two Kitzhaber terms beginning in 1995, an era of process-oriented policy-making without actual progress that continued for another eight years under Ted Kulongoski, only to get even more ineffective under yet another Kitzhaber period. If we had ranked-choice voting in 2002, Kulongoski might not have won. He got only 49 percent of the vote, while the Republican and Libertarian together got 51. Thinking of alternative history — how things might have turned out differently if only this or that had gone the other way — is risky. But I can imagine that with ranked-choice voting, the state would not have been wasting huge chunks of money on ill-considered and ultimately worthless projects and policies, Oregon might not have taken on a huge debt that strangles our ability to pay for public programs like schools, and perhaps large regions of the state would not have become as alienated from the Democratic power centers as they have become. These creatures are lucky they don’t have to worry about voting. Ranked-choice voting is a better way? Perhaps. The current two-party process certainly favors committed partisans. Ranked-choice would re-balance the scale for the largest group of voters – independents who don’t blindly follow a party line. But if I recall, the bigger problem in Albany politics is voter apathy. The turnouts for recent city elections were pathetically small, and lots of folks refused to vote for any candidate judging by the number of undervotes (see races for Mayor & Councilors). Ranked-choice can’t fix disinterest. Incentivize elected positions and the quality of leadership improves. That’s the textbook definition of a capitalistic democracy. The current system relies on the proposition that somehow human nature can rise above the sordid to lead the citizenry ethically. The current power base is proof enough of the frailty in that thinking. Make the difficult job of governing the ungovernable worth doing and governance will improve. Plurality voting (especially with “winner take all”) gave us Donald Trump, who will now give us Hillary Clinton and a noisy minority of Americans who think the Nov. 8 election was stolen and the whole “system” is rigged. Ranked-choice voting: Republican primaries and caucuses, someone other than Trump or Cruz would likely have won, and gone on to easily defeat Hillary. Harder to guess for the Democrats – perhaps more and better candidates would have tried. In any case, we would have been better off. Madam President vs.the deplorables! vs. the remnants of the Republican party. Fasten your seatbelt. The founders of the country didn’t envision the concept of “parties”. They’d worked out compromises and moved on. The parties arose because people with similar inclinations needed to support each other. The candidates that they brought forward for elections were decided privately, within the party. The primaries came about to allow people removed from the seats of power to participate in choosing the candidates for a particular party to bring forward.. I find the theory that independents have a right to participate in a primary as weak. By not choosing a party, they have already voted their opinion. Having said that, the open primary is just a general election by another name. What problem does that really fix?